The Tragedy at Midnight Premiere of “The Dark Knight Rises” Raises Questions of Violence in Modern America : COMICS ARE EVERYWHERE! 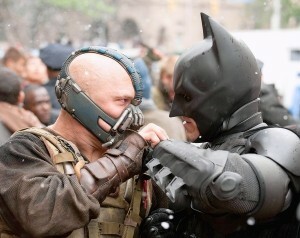 Bane (Tom Hardy) faces off with Batman (Christian Bale) in Christopher Nolan's "The Dark Knight Rises." The terrible mass-murder at the midnight premiere of Christopher Nolan’s The Dark Knight Rises, in Aurora, Colorado will forever be linked in the minds and hearts of the public to the brilliant final installment of the filmmaker’s epic Batman trilogy. Los Angeles Times film critic Kenneth Turan’s thought-provoking essay probes the question of blame and the ongoing issue of violence in modern America. This article is one of the first of many media commentaries and op-ed pieces yet to come as the nation reels in the tragic shock and aftermath of the worst shooting in U.S. history.